Every risk has a root cause. In the case of projects, the risk root cause will originate from one or more of three sources: Process, People or Product. The majority of risks that are causing a project to fail are associated with Process and/or People root causes. It is crucial during the Indentify face to register identified risks with the Cause-Risk-Effect format in order to show that you have clearly understood them. 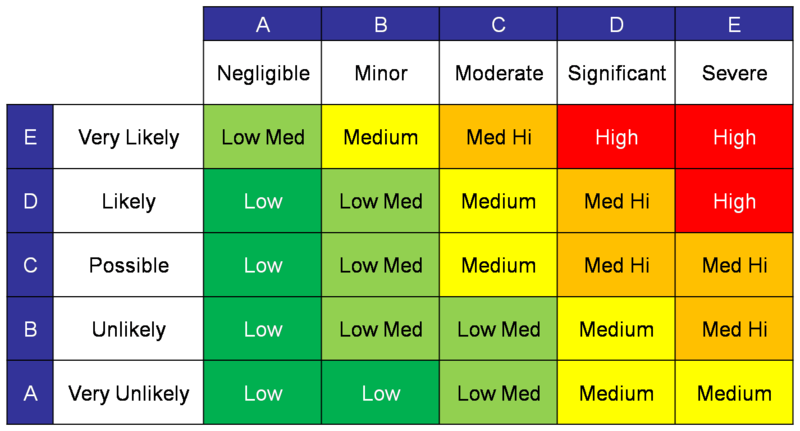 Moreover, this helps you at the Risk Response Planning to properly select the right response strategy. Below you can find samples of how to express identified risks in the above mentioned format. We can run our Risk Management courses worldwide by making training more convenient for you. To get more details, please contact with us directly. This entry was posted in ITTO's and tagged Cause-Risk-Effect, Fourtounas, Human Asset, Identify Risks, ITTO's, Διαχείριση Ρισκου, Διακινδύνευση, Ρίσκα, Σεμινάρια, Σεμινάριο, Φουρτούνας, PMI-RMP, PMP, Project, Risk, Risk Management, Risk Response, Seminars, Tips. In the world of projects, contracts are used for make or buy deals but also for establishing partnerships like Joint Ventures or for safety by buying insurances. The parties involved in this “engagement”, decide the type of the contract which varies depending on the type of the work and the nature of the industry. A contract, to put it in simple words, is an elaborated agreement between two or more parties where one or more parties may provide products or services in return to something provided by other parties (client). Of all contracts, this is the simplest type, where all the terms are quite straightforward and easy to understand. The service provider agrees to provide a well defined service for a specific period of time and the client agrees to pay a fixed amount of money for the service. Inside this contract the parties may define various milestones for the deliveries, KPIs (Key Performance Indicators) and also acceptance criteria for the milestones and the final delivery. The main advantages of this type of contract is that the contractor knows the total project cost before the project commences so the risk for him is low while for the seller the risk is high. Requires well-defined SOW and requirements. In this contract model, the services provider is reimbursed for their machinery, labour and other costs, in addition to contractor paying an agreed fee to the service provider. In this method, the service provider should offer a detailed schedule and the resource allocation for the project. Apart from that, all the costs should be properly listed and should be reported to the contractor periodically. The payments may be paid by the contractor at a certain frequency (such as monthly, quarterly etc) or by the end of milestones. 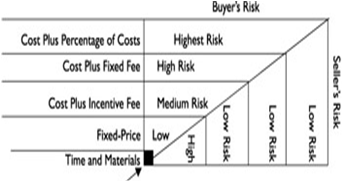 From risk perspective is the opposite from Fixed price contracts, while the risk lies on the shoulders of the contractor . This engagement type is the most risk-free or neutral type where the time and material used for the project are priced. The contractor only requires knowing the time and material for the project in order to make the payments. This type of contract has short delivery cycles, and for each cycle, separate estimates are sent of the contractor. Once the contractor signs off the estimate and Statement of Work (SOW), the service provider can start work. A PMI-RMP candidate may face during the exam, a couple of questions regarding Procurements. Procurement documents are inputs at the Identify Risk process but they are also used at the Plan Risk Responses face for sharing or transfer risk strategies. So, selecting the contract type is one of the most crucial steps of establishing a business agreements. This step determines the possible engagement risks. Therefore, companies should get into contracts where there is a minimum risk for their business. It is always a good idea to engage in fixed bids (fixed priced) whenever the project is short-termed and predictable. If the project nature is exploratory, it is always best to adopt T&M or Cost Reimbursable contract types. We can run our Risk Management courses worldwide by making training more convenient for you. To get more details, please contact us directly. This entry was posted in ITTO's and tagged Cost reimbursable, Fixed Price, Fourtounas, Human Asset, Identify Risks, ITTO's, Διαχείριση Ρισκου, Ρίσκα, Σεμινάρια, Σεμινάριο, Φουρτούνας, Management, PMI-RMP, PMP, Procurement, procurements, Project, Quick guide, Risk, Risk Management, Seminars, T&M. A number of my on-line students are asking a lot of questions during the process of scheduling their PMI-RMP® exam date. This entry was posted in Examination and tagged Fourtounas, Human Asset, Διαχείριση Ρισκου, Διακινδύνευση, Σεμινάρια, Σεμινάριο, Φουρτούνας, Management, PMI-RMP, Prometric, Risk, Risk Management, Schedule exam, Seminars, Tips. Enterprise Environmental Factors vs Organizational Process Assets. Anyone who is studying for the PMI-RMP® exam must understand the Enterprise Environmental Factors (EEF) and the Organizational Process Assets (OPA´s). In the 5th edition of the Guide to the Project Management Body of knowledge (PMBoK®), EEF and OPA feature as inputs to or outputs in most of the project management processes and as inputs in all the Risk processes. So it is worthwhile getting an intuitive understanding of what these are as well as the difference among them. The PMBoK® offers a long list of factors and there is a temptation among students to learn these off but PMI-RMP ® exam wants to apply your knowledge in realistic situations, so understanding them is more important than raw knowledge. In essence, Enterprise Environment Factors (EEF’s) make up the environment your project functions in and they are internal and external factors. Moreover, they are factors that influence or constrain or direct your project and you are not controlling them entirely (like OPA). So, for example, you need to consider the company you work for – its culture and structure – and the market your company is aiming for – its regulatory environment and the needs and wants of its customer base. Government and Industry standards ( Regulatory Agency ). Infrastructure ( Existing facilities, capital equipment ). On the other hand, Organizational Process Assets (OPA) are the plans, processes, policies, procedures, historical information and knowledge bases specificto and used by the performing organization. The planned and actual schedules from previous projects, the lessons learned documentation and the various logs and registers from earlier projects will help you understand the environment you will have to master. They will give you valuable insights into who are the good people, who are the difficult stakeholders and what risks should be considered in this new environment. Moreover, you will likely find templates for the major documents and encounter strange names for familiar artefacts – for instance, the Project Charter is sometimes called a Project Proposal. 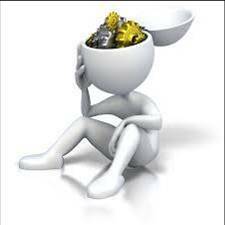 So the Organizational Process Assets often have to be filtered through your PMP® or PMI-RMP® knowledge to find out what they are actually for. Finally of course, a sound project closure process will provide the knowledge base that forms the other aspect of Organizational Process Assets. Risk breakdown Structure ( RBS ). 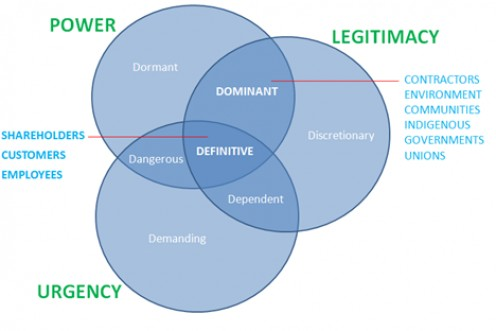 Risk tolerance areas and risk thresholds. This entry was posted in General and tagged EEF, Enterprise Environment Factors, Fourtounas, Human Asset, Identify Risks, ITTO's, Διαχείριση Ρισκου, Διακινδύνευση, Ρίσκα, Σεμινάρια, Σεμινάριο, Φουρτούνας, Management, OPA, Organizational Process Assets, PMI-RMP, PMP, Project, Qualitative, Quantitative, Risk, Risk Management, Seminars, Tips. Our course, specifically prepares you for acquiring the PMI-RMP® (Risk Management Professional) certification. The online preparation – workshops are being conducted at pre-arranged online meetings between the instructor and the trainee-s. The course schedule is rather flexible and adaptable to your particular needs and constraints. This entry was posted in Courses, Examination, General and tagged Fourtounas, Human Asset, Identify Risks, ITTO's, Διαχείριση Ρισκου, Διακινδύνευση, Κυριακίδης, Ρίσκα, Σεμινάρια, Σεμινάριο, Φουρτούνας, Management, PMI-RMP, PMP, Project, Qualitative, Quantitative, Quick guide, Risk, Risk Management, Seminars, SH's, Stakeholders. Risk Management is a process of identifying risks, analyse them, planning responses and control them throughout the project life cycle. But the first step is the Risk Management Plan which is a document that contains a detailed plan of how to execute the above mentioned. In other words it describes how the risk management activities will be carried out in the project. This entry was posted in General, Tools & Techniques and tagged Communication, Fourtounas, Human Asset, Identify Risks, ITTO's, Διαχείριση Ρισκου, Διακινδύνευση, Κυριακίδης, Σεμινάρια, Σεμινάριο, Φουρτούνας, Management, PMI-RMP, PMP, Project, proverb, Qualitative, Quantitative, Quick guide, Risk, Risk Management, Seminars, SH's, Stakeholders, Tips. Νέο σεμινάριο Risk Management στις 13 Ιουνίου στην Αθήνα από την Human Asset. Έπειτα από τα επιτυχημένα σεμινάρια στη Θεσσαλονίκη και τους πρώτους επιτυχόντες στις εξετάσεις πιστοποίησης, το νέο σεμινάριο RiskManagement της HumanAsset στις 13 Ιουνίου στη Αθήνα είναι γεγονός! Η ομάδα ήδη έχει αρχίσει να συμπληρώνεται και οι θέσεις είναι περιορισμένες για καλύτερη απόδοση του προγράμματος. This entry was posted in Courses and tagged Fourtounas, Human Asset, Identify Risks, ITTO's, Διαχείριση Ρισκου, Διακινδύνευση, Σεμινάρια, Σεμινάριο, Φουρτούνας, Management, PMI-RMP, PMP, Project, Qualitative, Quantitative, Risk, Risk Management, Seminars, SH's, Stakeholders.